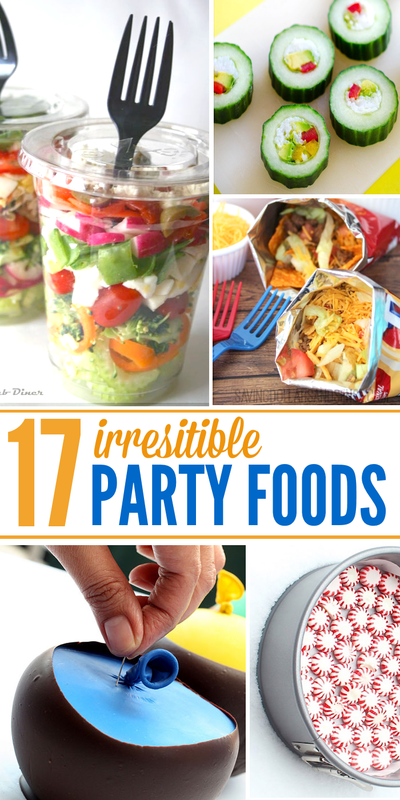 Looking for some perfectly portable snack ideas for your next party? We’ve got you covered! These party food ideas are sure to please, and will make folks think you spent months planning. 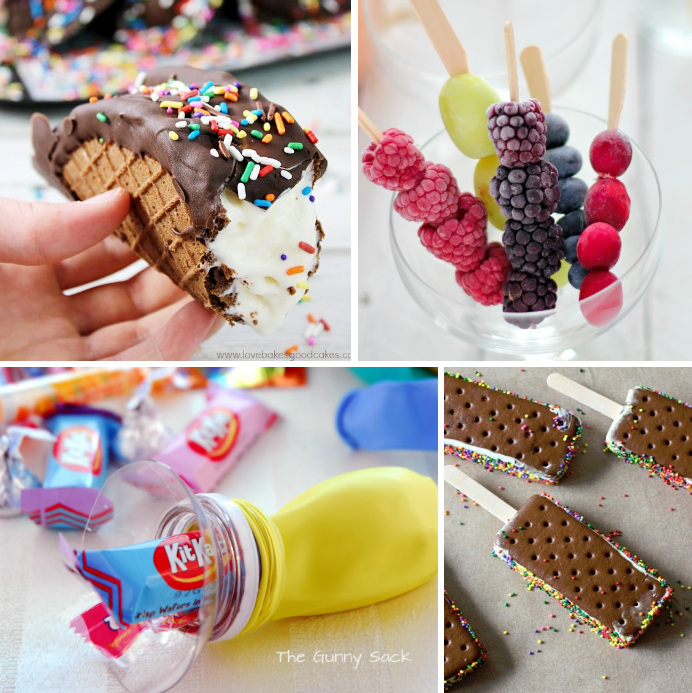 Adults and kids alike are sure to love these irresistible party hack ideas! …AND they are (for the most part) super easy to pull off!! Anyone can make these look great – no pinterest fails here! If you have an outdoor kitchen, be sure to check out our collection of sides on the grill – all the best grilling BBQ recipes! Choco Tacos– Chaco Tacos, anyone? 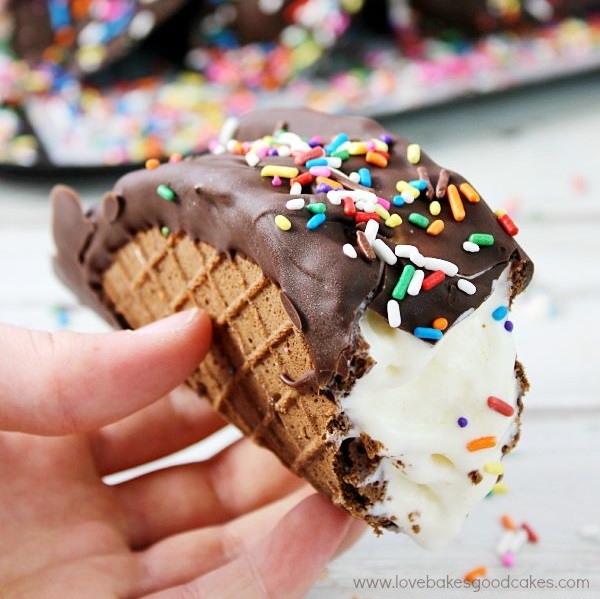 These just bring a certain nostalgia back to me….choco tacos…ahhh…who doesn’t love a chaco taco!? Delicious! Watermelon on a stick– Watermelon=good. 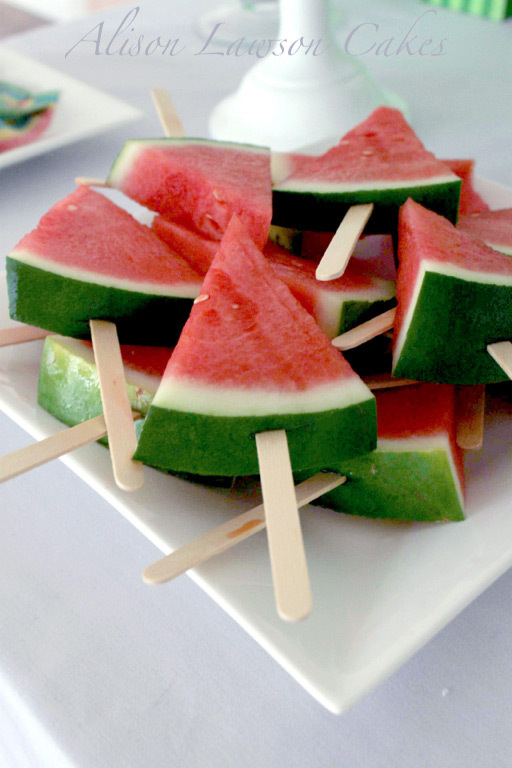 Watermelon on a stick = great! You’re kids will get a kick out of these “healthy popcicles” All you need are popcicle sticks and a ripe and juicy watermelon. 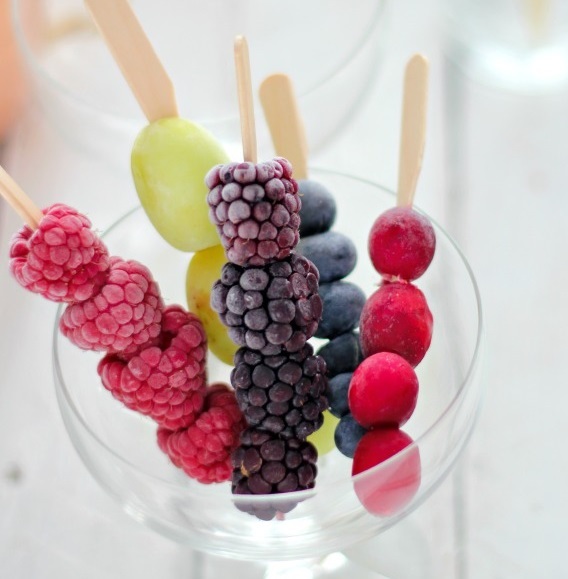 Frozen Fruit Picks-These are a great addition to your favorite beverage. Simply put your chosen fruit on a pick, and freeze. Drop into your favorite beverage before serving. Perfect for cocktails or kids fruit punch. Did I mention how pretty they are? 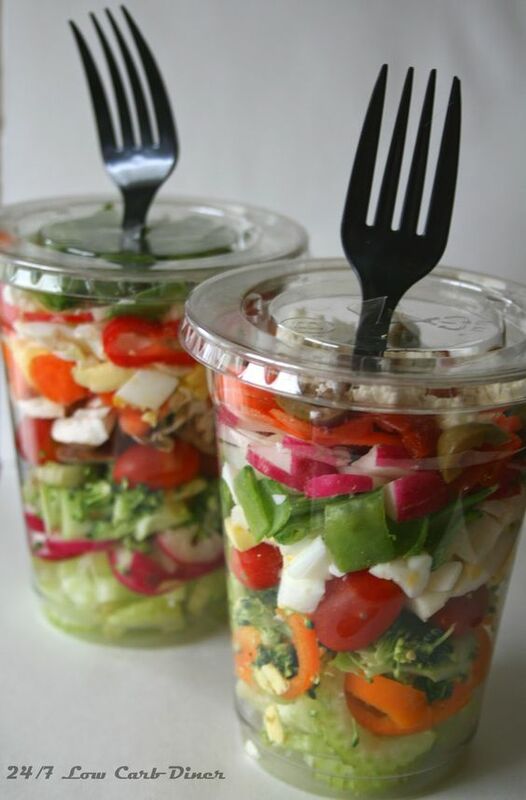 Salad in a Cup– We are in love with this idea…Put your salad in a plastic cup with a lid for a perfectly portioned and portable salad. Add the fork where the straw goes and BAM! You’re ready to take your salad anywhere. 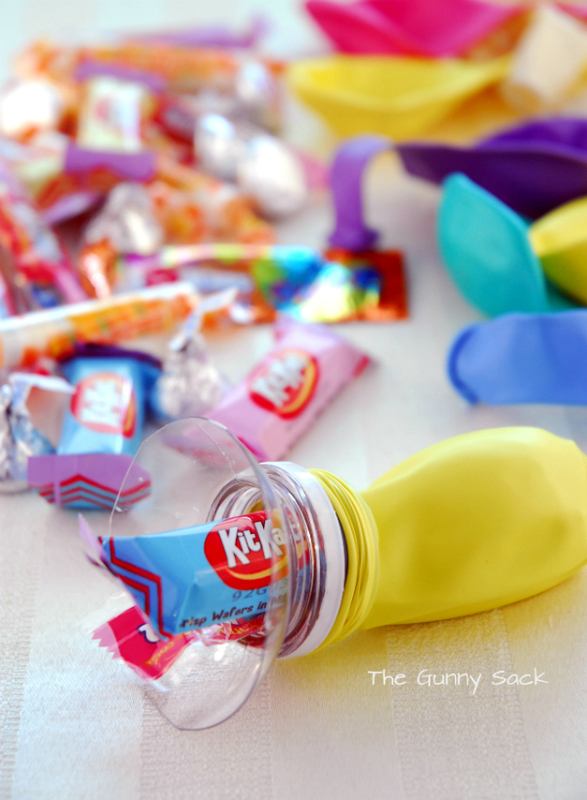 Treat Filled Balloons– Simply cut the top off of a plastic bottle and use it as a funnel to add treats to balloons. Banana Pops. Check out this amazing video for Banana Skewer Pops! That’s sure to be your new favorite snack. These are easy for kids to make too! 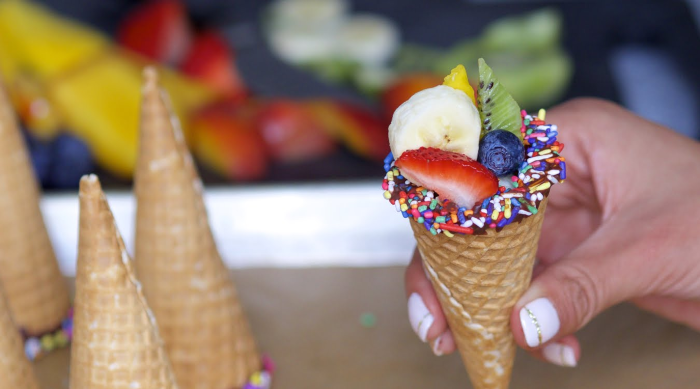 Fruit cones– So pretty, so portable. These fruit cones are a great way to get your kids to eat their fruit. These chocolate dipped fruit cones are sure to be a hit with adults and kids alike! Plus, they are SO fancy looking! 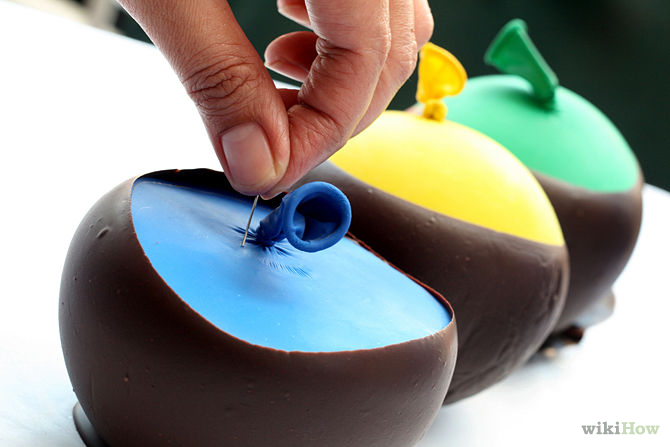 Chocolate bowls– These chocolate dessert bowls are a simple to make and so pretty filled with fresh fruit or ice cream. Got leftover fruit?? You won’t believe how easy it is to create beautiful, tasty and healthy popsicles! 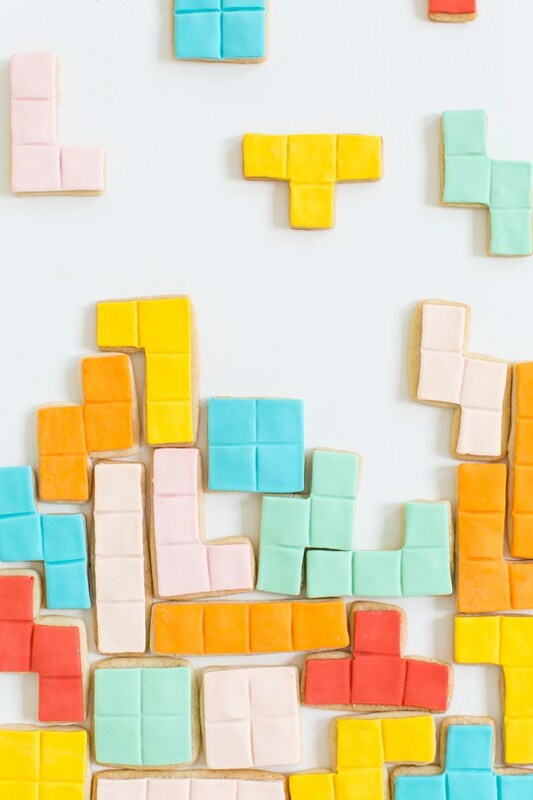 Tetris Cookies– Tetris. Need we say more? These cookies would be awesome for the video game lover in the family. Be sure to display them like the game on a big tray. Candy Plate– Wowsers! This is totally cool!! You can serve desserts on a candy plate! These are easier to make than you might think. 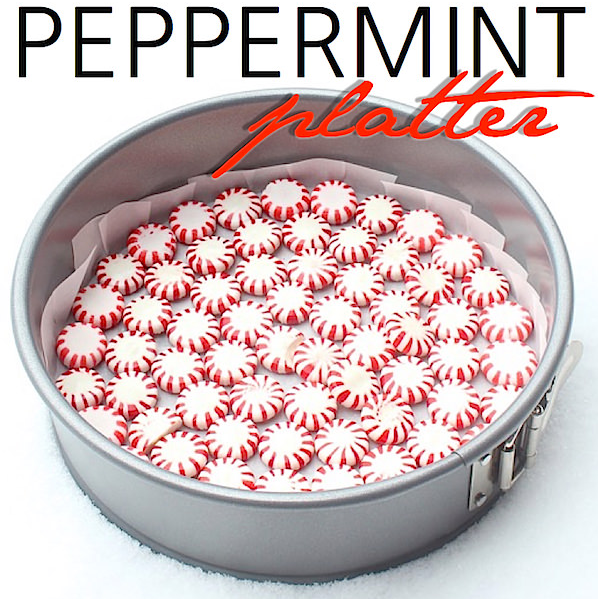 Make them out of peppermints or even jolly ranchers! 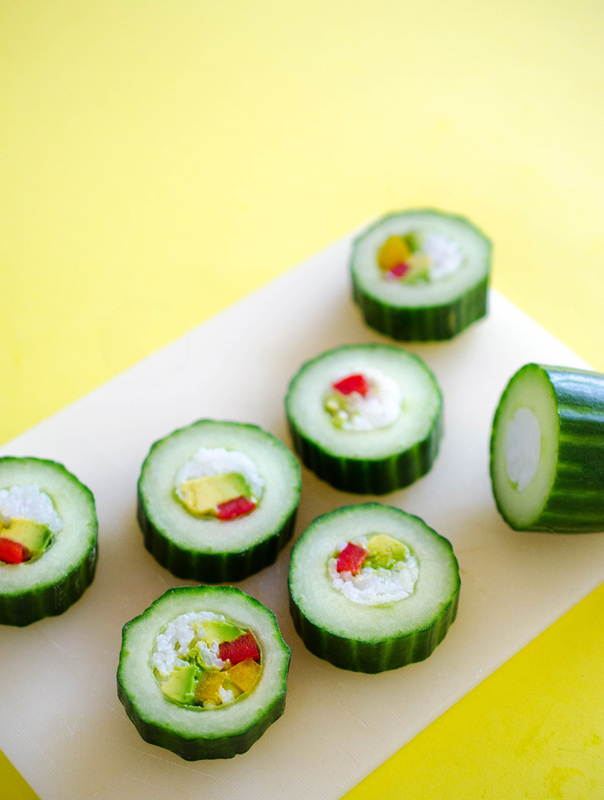 Cucumber Sushi Rolls– How cool is this? These cucumber sushi rolls are a perfect snack on a hot summer day. What a fun way to eat your veggies! Cupcakes in a cone are always a hit! So adorable, and portable! 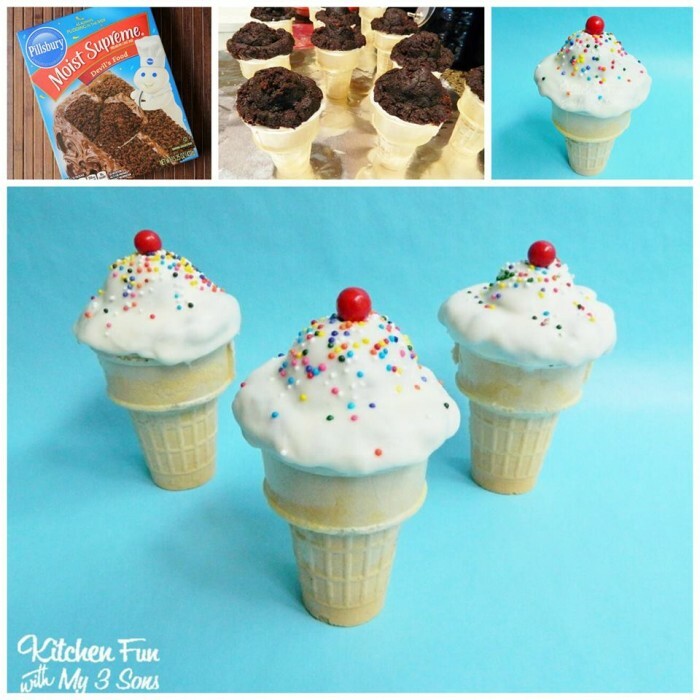 Your kids will get a kick out of tricking their friends with their “icecream” cupcakes! Ice cream-pops! 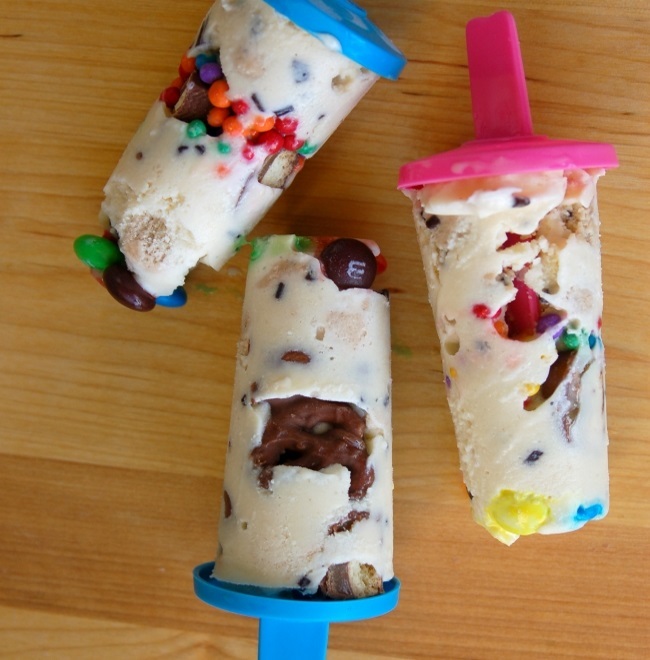 Fill your popcicle molds with a layer of ice cream and then add a layer of your favorite candies. Alternate candy and ice cream until the mold is full. These are a great activity to do with your kids. They can get as creative as they want! 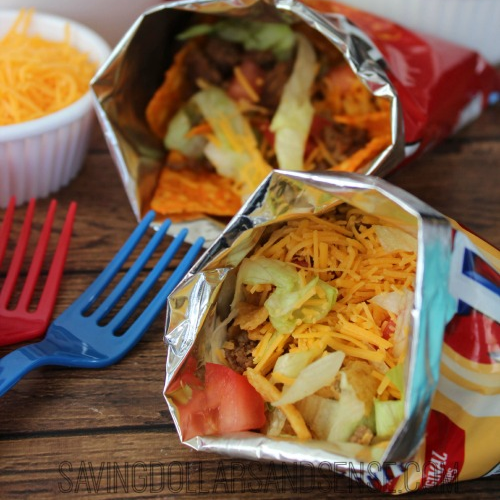 Taco sack-Crush up your favorite chips, and add taco fixings like ground beef, cheese, lettuce and tomatoes. Throw in a plastic fork and you have tacos you can eat on the go. We like to use mini bags of Doritos or Fritos. Pool Raft Cooler. Did your kids outgrow the baby pool? You can still put it to good use. 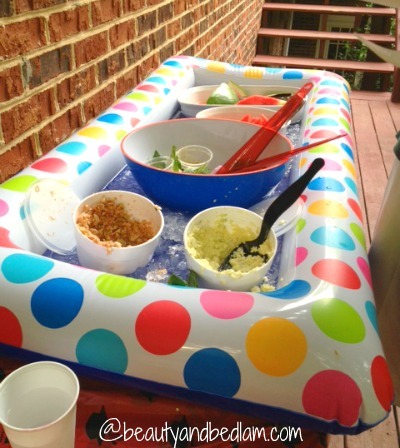 This baby pool makes a perfect salad bar on a hot summer day! Just add ice. 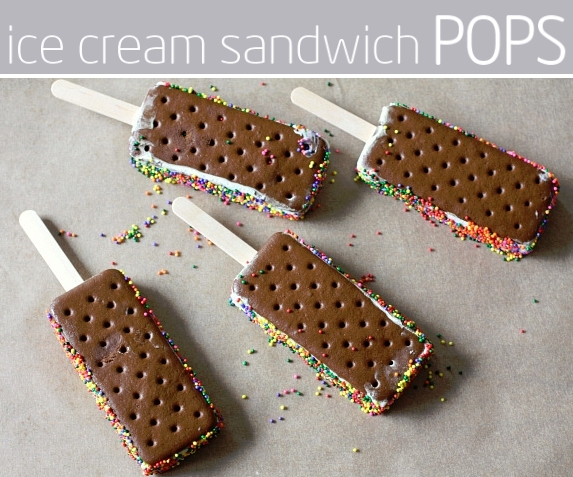 Ice Cream Sandwich Pops– Simply buy a box of ice cream sandwiches, coat the exposed ice cream with sprinkles and put a stick in the bottom. These are quick to make, and oh, so adorable. 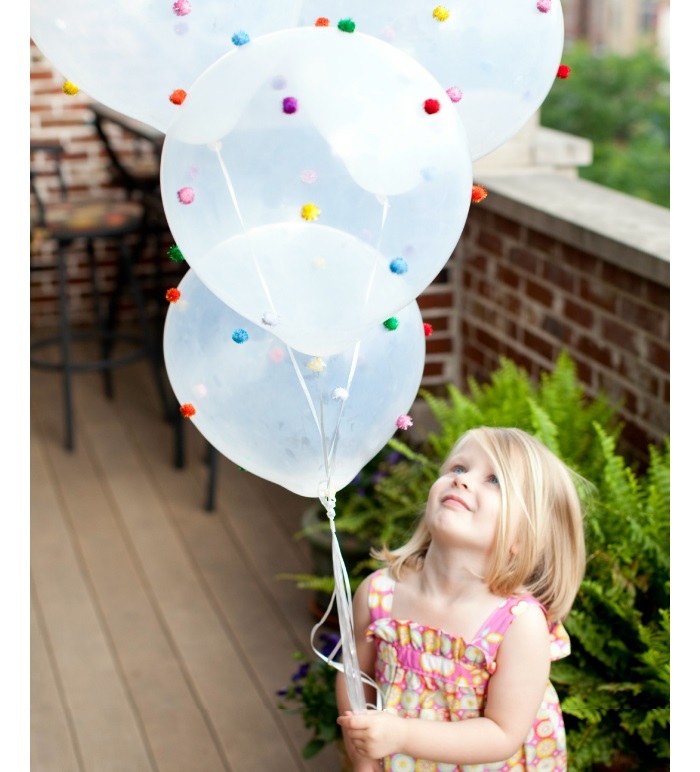 Pom-Pom balloons– Add pom-poms to balloons with double sided tape for a little extra magic. These are simply sweet. Your party is sure to be a success with these kid tested and approved snacks and ideas!!. We chose most of these snack ideas for their simplicity– they are a perfect way to add a more personal touch to your next party. Simple snack ideas, so you can spend more time enjoying your party. What Do I Feed a Party? What other party tricks and ideas do you have?? If you are a blogger, or just someone with a great idea, hop over to our Facebook community! Leave a photo with your idea, your link and a description of your tip! We regularly feature posts and ideas that are shared inside our Facebook community!